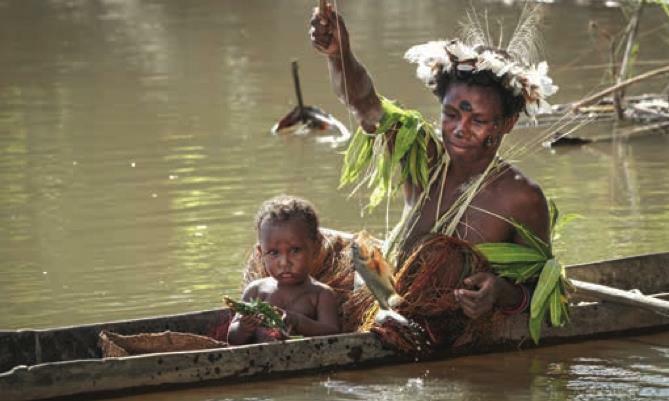 After being dropped by charter plane on a grass airstrip, it is obvious that the Karawari River region is one of the more remote areas in Papua New Guinea’s densely rainforested lowlands. I am surrounded by jungle echoing with the calls of birds of paradise and other species. 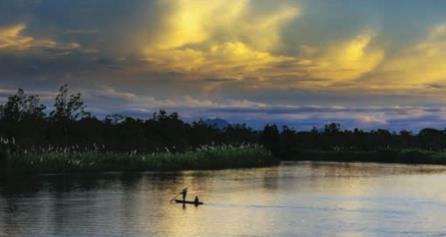 From here, it is a short hike to the smooth-flowing Karawari River, followed by a boat ride to our accommodation at Karawari Lodge – my base from which to explore one of PNG’s unspoilt and culturally rich regions. The only access, in or out, is via the private grass airstrip or, for locals, along the river. The lodge accommodation is traditionally built and wonderfully comfortable. day along the Karawari River and one of its tributaries, the Konmei River. no cellphones. 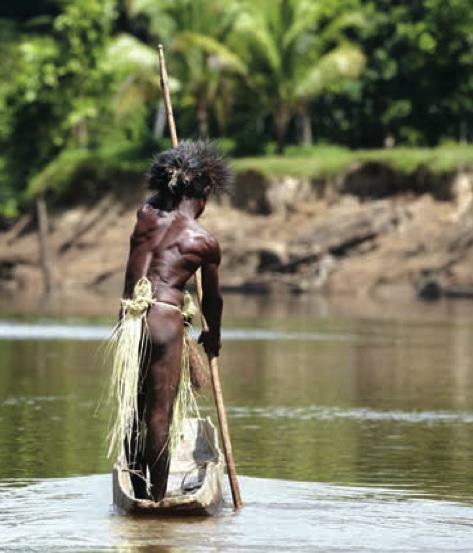 Days are spent fishing from dugout canoes and harvesting sago – a starchy extract found in the spongy centre of various tropical palm stems (the most common being the sago palm) and which, together with fish, makes up the staple diet for the villagers in these lowland regions. A fish closely related to the piranha inhabits the river here and is caught by hand from dugout canoes. Women are regularly seen fishing, and also cooking, in their canoes, with one end of the vessel dedicated to a smouldering fire on which they smoke the freshly caught fish. Babies and children are part of the action, and sit perched in the dugouts from an early age, or crowd around the cookfires helping their mothers. I find it interesting to note that women paddle their canoes seated but men paddle standing. Perhaps these are the first ever stand-up paddle boarders? The unhurried pace of life, to a background of bird calls and the odd human shout from across the river, sets a scene of acceptance and proud self-sufficiency. The cultural features of the tribes differ significantly between the villages, with unique face painting and personal adornment distinct to each. I am fortunate to be allowed into the spirit house in Tangamimbit village, where human skulls – from as recent as the 1960s when cannibalism and head hunting were still a part of daily life – adorn the walls. But despite their grisly history, the villagers are content and happy people, eager to share their hospitality with us.